A "sandwich" of two shots taken recently. Sunset - cliche - I know. 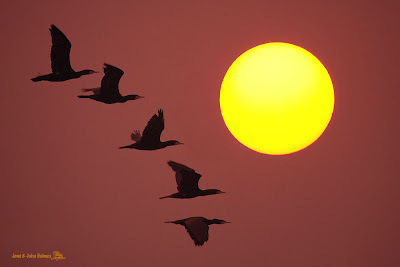 I posted a less orange version of this on the HKBWS website as "Sunset Cormorants". If nature doesn't produce, you've just got to take matters into your own hands. Or something. 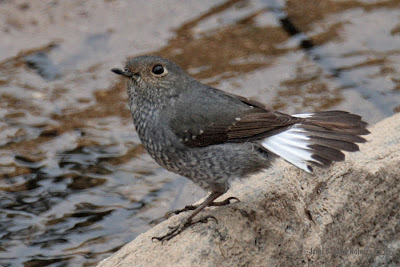 This one has been around the edge of Plover Cove Reservoir at Chung Mei. Yesterday we went for a "pelagic" on Andrew H's company boat. Great boat, shame about the weather, very MISTY. Not even a phalarope to be seen. 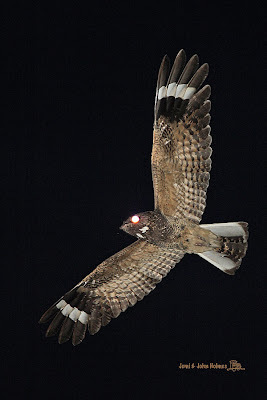 Back home in the evening, we heard the distinct ( like polystyrene dragged acrooss a pane of glass ) call of Savanna Nightjar. The first of spring. This is a call we'll be hearing well into April. Here's one I photographed a couple of years ago. Yes, you heard it here last. A dead Grey Heron was found at Mai Po Nature Reserve on Feb. 2nd. AFCD took it away for testing and by the afternoon of the 5th the result was declared that it had H5N1. So, as happens when dead birds are found within a 3km radius of Mai Po, the Nature Reserve is "closed" to the public for three weeks. The Government didn't shut down the Mongkok caged bird market when a dead Peregrine was found nearby, and it's business as usual for poultry markets everywhere in Hong Kong, even though dead birds have turned up fairly regularly in the urban areas too. Quite a few dead chickens have been found on beaches recently. 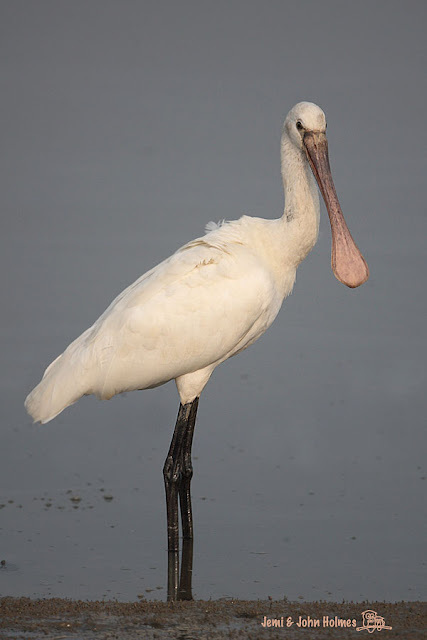 These get picked over by birds such as Black Kites, Gulls and Collared Crows. Whatever the Grey Heron ate, it is a "victim" of bird 'flu as well. Closing Mai Po is a cheap, empty gesture for the government to make. But WWF-HK will lose about $200,000.- in visitor revenue during the closure period, so it matters to their "bottom line". 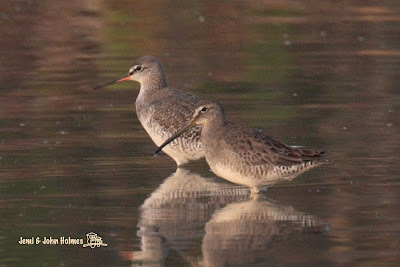 The birders visiting Mai Po on the afternoon of 5th Feb. were advised to leave. We didn't hurry. Here's one I took on the way out. 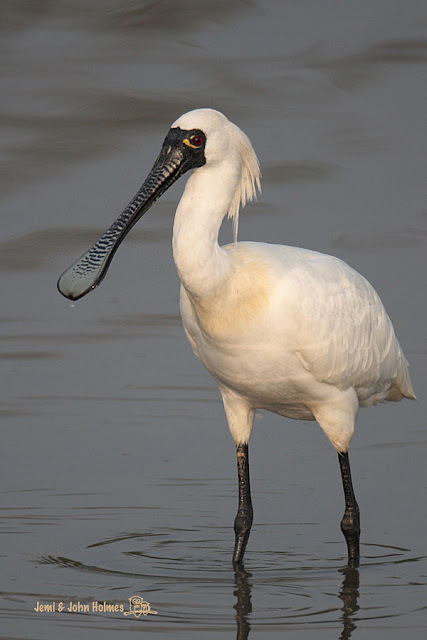 The most regular "American" wader we get ! 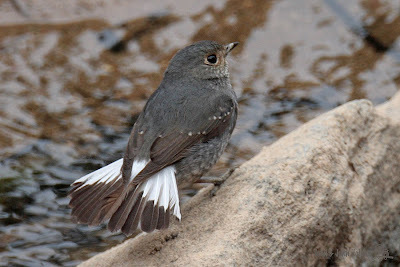 Some good birds had been seen by Dave D. over the LNY holidays. 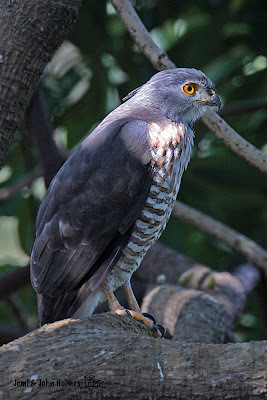 No exotic thrushes on the day WE went, but a Crested Goshawk ignored a dozen photographers and sat out in the open. We could even see its' crest. 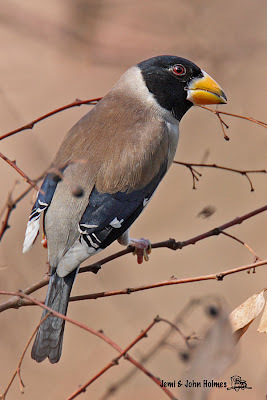 And Euphona migratoria, whether you call it "Yellow-billed" or "Chinese" Grosbeak, is still a handsome beast.